Students, researchers and academics from across a variety of disciplines use data visualisations and infographics in their blogs and projects to better tell the stories in their data and enhance audience understanding. 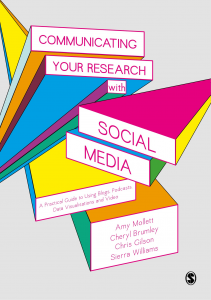 As part of a series previewing their new book Communicating Your Research with Social Media, Amy Mollett, Cheryl Brumley, Chris Gilson and Sierra Williams explore a short history of data visualisation over the past 200 years. Whether you are an astrophysicist looking to share research on stellar structure with students, a nurse looking to start discussions around ward hygiene with colleagues, or a criminologist looking to get journalists and policymakers interested in your research on reoffending patterns, using infographics and data visualisations as part of your research communication strategy can be an exciting and effective way to reach people who will find your work useful. The buzz around infographics and data visualisations on social media may lead us to think of them as something of a modern phenomenon. But the popular infographics we read, share, and create today have roots in much older scientific visualisation techniques and research communication efforts going back hundreds of years. These are our favourite moments but we’d love to hear about your favourite moments in the history of data visualisation too – please add them to the comments underneath this blog post. This “Diagram of the causes of mortality in the army in the East” was published in Notes on Matters Affecting the Health, Efficiency, and Hospital Administration of the British Army and sent to Queen Victoria in 1858 [public domain], via Wikimedia Commons. When Florence Nightingale arrived at Selimiye Barracks in November 1854 to help care for wounded British soldiers fighting in the Crimean War, she was met by hygiene levels so poor that ten times as many soldiers were dying from preventable illnesses such as typhus and dysentery than from battle wounds. Introducing a new hygiene regime, Nightingale tracked the swift reduction in preventable deaths. After the war, Nightingale outlined her recommendations for preventing more unnecessary deaths on the battlefield in a report to the British Government. Despite wide support, her recommendations were ignored and no action was taken. 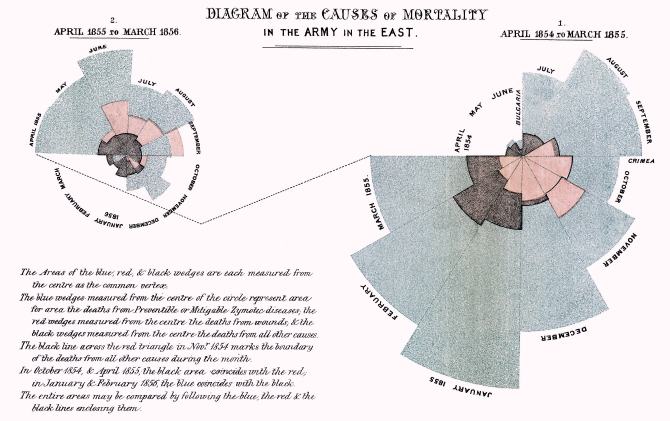 Frustrated, but not deterred, Nightingale created and widely distributed visualisations of the data from the original report, making exceptionally clear to any reader the need for health reform in the Army. Nightingale designed rose diagrams, which used segmented discs to show data on the causes of deaths in the Crimean hospital camps each month. The data visualisations had their intended impact: Nightingale’s recommended reforms for battlefield hospital camps were embraced and helped to save countless lives. An inspirational pioneer, Nightingale was elected the first female member of the Royal Statistical Society in 1859 and later became an honorary member of the American Statistical Association. Poverty map of Old Nichol slum, East End of London, showing Bethnal Green Road, from Charles Booth’s Labour and Life of the People. Volume 1: East London (London: Macmillan, 1889) [public domain], via Wikimedia Commons. 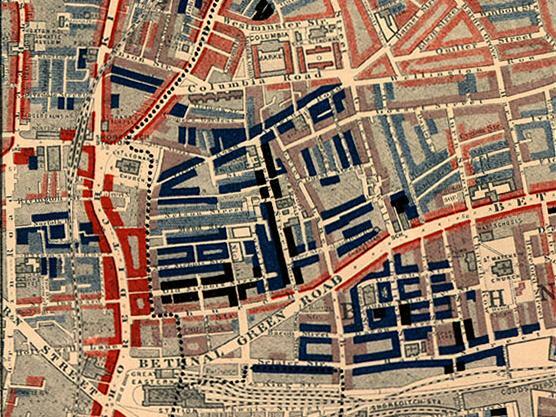 Charles Booth’s maps of poverty levels in Victorian London have been highly influential in shaping how statistics can be presented through maps. Social reformer Booth’s detailed maps – produced in 17 volumes between 1889 and 1903 – showed the results of survey data about levels of income from more than 100,000 households across London. With streets and buildings coloured to correspond to social class, general trends across the capital can easily be spotted. Yellow indicates the most wealthy upper classes; red and pink the comfortable middle classes; light blue the poor and casual labourers; and black, in Booth’s words, “the lowest class; vicious; semi-criminal”. Booth’s research – carried out with a team of volunteers including economist Clara Collet and LSE co-founder Beatrice Webb – was triggered by a desire to counter the sensationalised reporting of rioting in London during February 1886, the causes of which were wrongly attributed to a dangerous social revolution rather than poverty. Booth recognised the value of evidence in these discussions, and his maps were an effective addition to public debates about poverty, crime and society during this era. The maps have had a huge influence on cartography and social science research right up to today. In 1920s Vienna, sociologist Otto Neurath founded the social and economic museum of Vienna. Working together with illustrator Gerd Arntz and mathematician Marie Reidemeister, Neurath developed the International System of Typographic Picture Education – or Isotype – to use inside the museum: strikingly simple pictograms that enabled a wider understanding of the social, technological, biological, and historical ideas inside. The symbols themselves are packed with meaning and emotion, characterising social concepts with subtle accuracy. A famous example is the symbol for the unemployed: a sombre, hunched man with both hands in his pockets. Each Isotype symbol always represented the same concept – lending stability and continuity to the graphics. In the context of a city still young in its democracy and with low levels of literacy, Neurath sought to “give fundamental, strictly scientific information for social understanding, even to the less educated, without depressing them in the way learned books and statistical tables do” (Neurath, 1973: 217). The aim was to “represent social facts pictorially” and to bring “dead statistics” to life by making them visually attractive and memorable (Neurath, 1931/1991: 5, 57). The rise of Austrian fascism forced the trio to flee to the Netherlands where they set up the International Foundation for Visual Education in The Hague. Marie and Otto again fled from German invasion, this time to England, where they established the Isotype Institute in 1942. From here, Isotype was applied to wartime publications sponsored by the Ministry of Information. Neurath’s oft-quoted phrase has never been more poignant: “Words divide, pictures unite” (1931/1991: 569). Chapter 4 of the authors’ book Communicating Your Research with Social Media examines the ways knowledge workers can use academic blogging to promote their own research to wider audiences. If you’d like to purchase a copy of the book, SAGE offer a 20% discount to readers. Just enter the code is UKRM20 at the SAGE checkout.